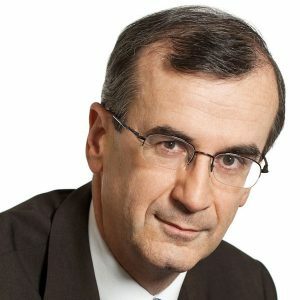 François Villeroy de Galhau is Chief Operating Officer of BNP Paribas in charge of Domestic Markets. He was born on February 24, 1959 in Strasbourg and has five children. François Villeroy started his career in the civil service, functioning as Senior Auditor at the French Treasury from 1984 to 1988. He then went on to become an advisor on Europe and financial matters to the Prime Minister and in Brussels. From 1997 to 2000 he was Head of Cabinet under Dominique Strauss-Kahn and Christian Sautter at the Ministry of the Economy and Finance and held the post of Director-General of Taxes from 2000 to 2003. He then left the civil service and joined BNP Paribas, initially as the CEO of Cetelem, the consumer credit subsidiary of the banking group. In 2007 he became CEO of BNP Paribas Personal Finance, and then Head of French Retail Banking (FRB). In 2008 François Villeroy took a seat on BNP Paribas’ executive committee. In 2011 he was appointed as Chief Operating Officer. Next to his work for BNP Paribas he also serves on several boards and commissions in the field of business development.